Yeah, I’d never heard of it either, but thanks to Food52 I got to give this chutney-ish Italian condiment a try. 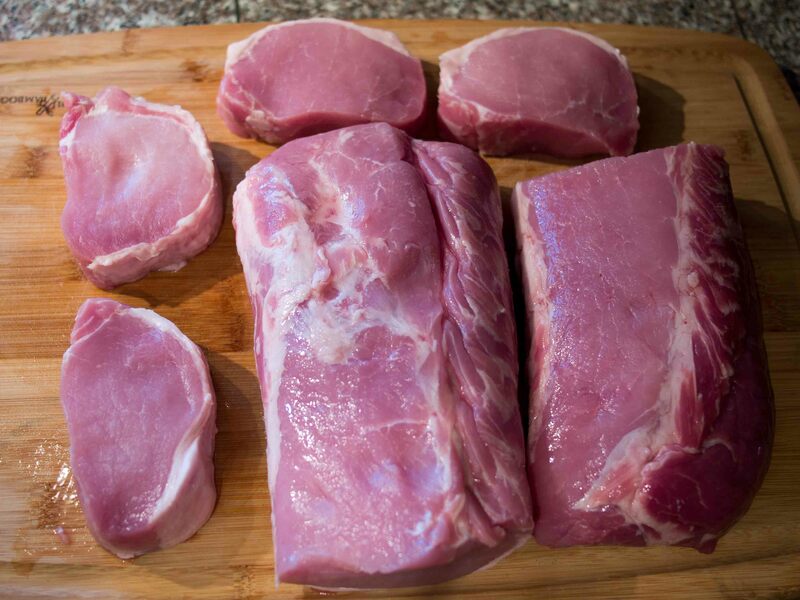 I got a whole pork loin and cut it into 4 nice and thick chops and 2 roasts for later. Mix the salt and sugar into the hot water and stir to dissolve. Stash in fridge to cool. Once it is cool, arrange the chops in a single layer in a shallow non-reactive dish (a glass pie plate works well) and then pour the brine over top. Let this sit for anywhere from 1/2 hour to 2 hours before cooking. Place the fennel, mustard seeds, sugar, vinegar, and water into a small sauce pan and bring to a boil over medium-high heat. While this is cooking, grate the orange peel (I use a microplane grater) to get 1 teaspoon of zest. 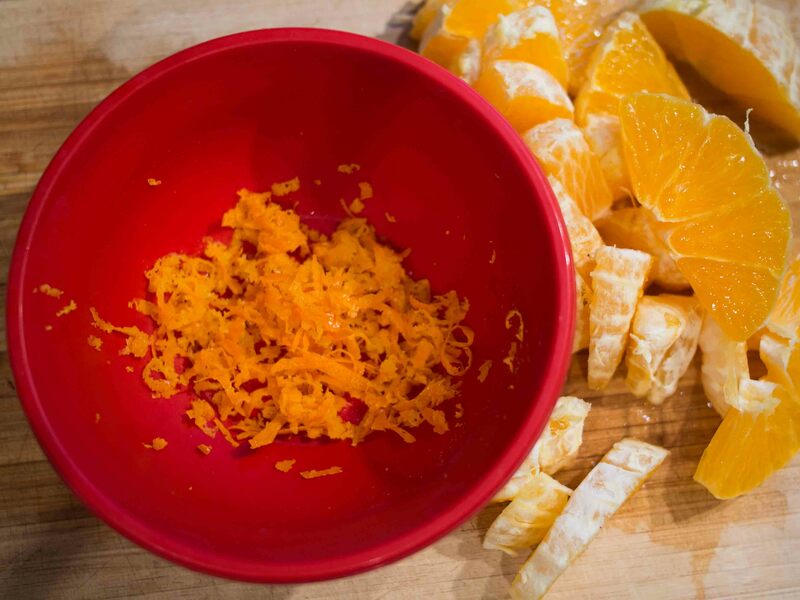 Peel the orange, removing as much of the pith as you can along with any seeds, rind or stringy bits. Dice the orange segments (I found it easiest to pull the orange in half and slice each half across the segments) and add to the sauce pan. 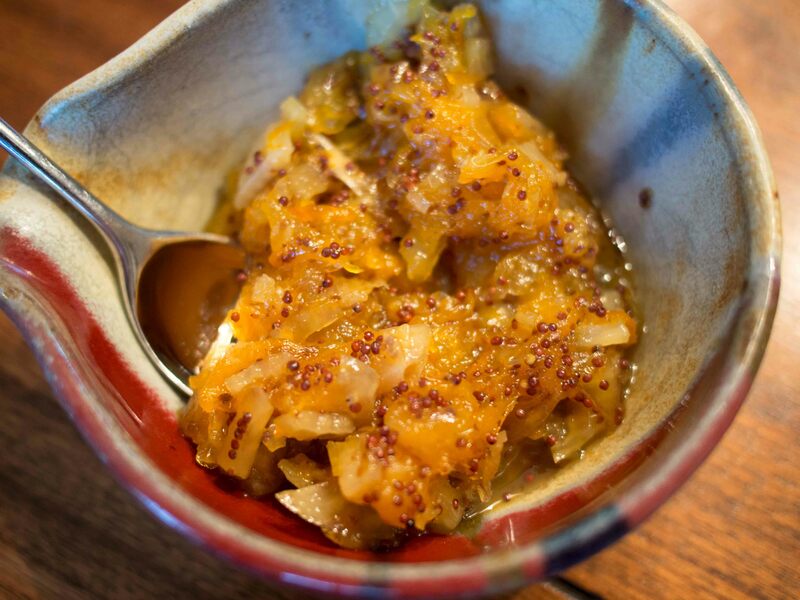 Bring the mixture back to a boil for 5 minutes, Reduce heat and simmer until the orange has broken down and the mustard seeds have plumped up and softened and the mostarda takes on a marmalade-like consistency, about 30 minutes. Stir in reserved orange zest and cook for 5 minutes more, then set aside to cool. Remove the chops from the brine and season them on both sides with your favorite rub (I used Dizzy Pig Raging River). Grill the chops 5 minutes on one side. Grill the chops 6 to 8 minutes per side (depending on how thick they are) until the internal temp hits 135°F (pork is done at 140°F, but I usually pull it at 135°F as the internal temp will rise as it rests). Remove from heat and let rest for 10 minutes. Serve with mostarda on the side. Wow! 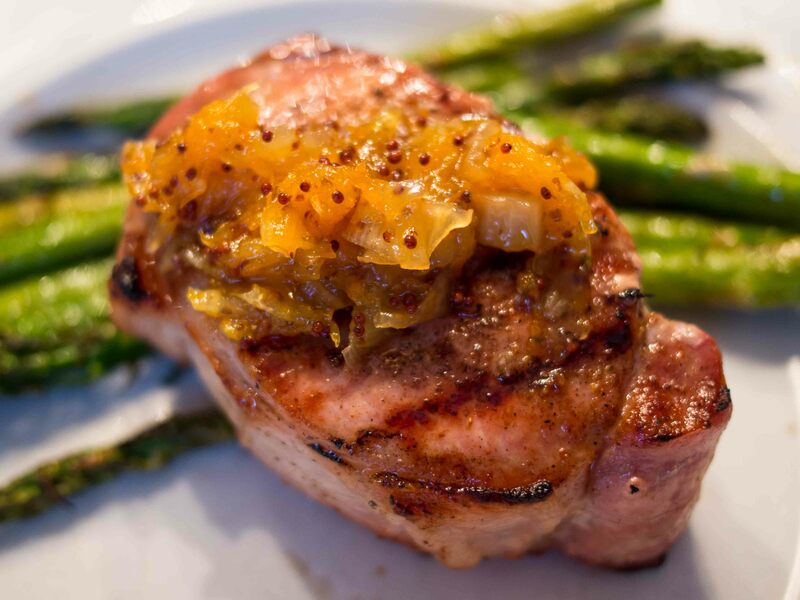 The chops themselves were tender and juicy, but add the sweet and savory mostarda and it’s a knockout. Why only 4 stars? As good as the mostarda was, the mustard taste didn’t come through as strongly as I would have liked. I used brown mustard seeds, so maybe that makes a difference? I would add a teaspoon or so of grainy mustard to this nest time. Also, the original recipe calls for 1/2 teaspoon of whole fennel seeds, which I was out of, and you could taste their absence. On the plus side – I have big plans for this condiment! I can easily see it as the filling for a butterflied pork loin roast or as a pan glaze similar to what I did with the Apricot-Glazed Pork Chops recipe. 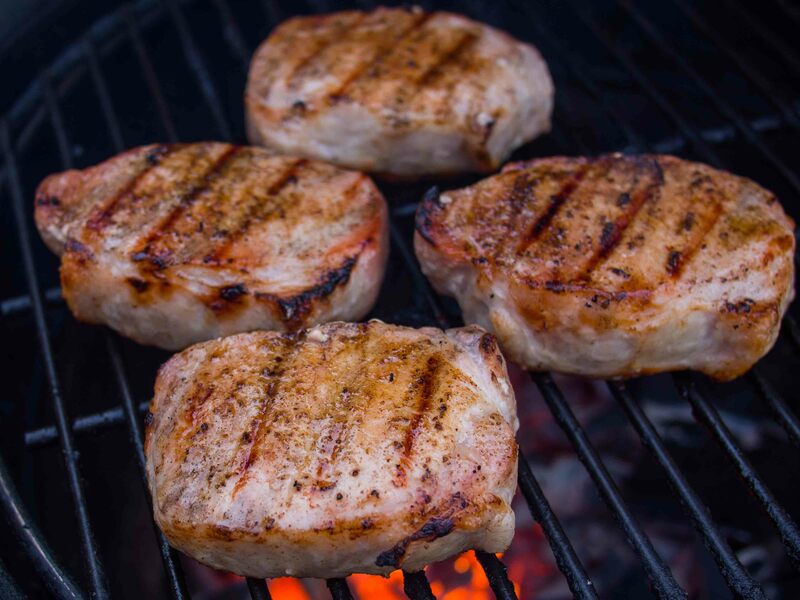 3 ounces of center-cut pork chops is 4 Weight Watchers points and 180 calories. The mostarda only adds 1 point and 50 calories per tablespoon. I can’t remember where, but I’ve had mostarda and went wild over it. This is a must make and very soon! Mostarda, nope never heard of it either. And as my wife and son dislike the taste of orange in their food, I guess I won’t be making this except in small batches.